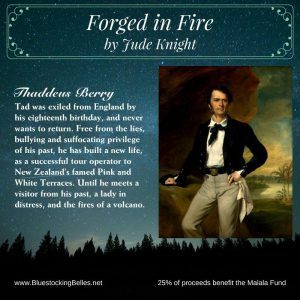 It’s First Kiss Friday and it’s my pleasure to welcome back my friend and fellow Bluestocking Belle, Jude Knight. 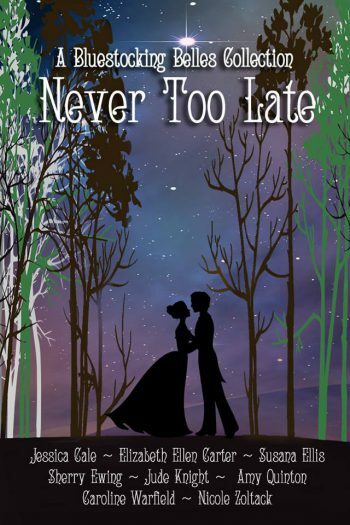 Jude is sharing an excerpt from her novella in our box set Never Too Late. 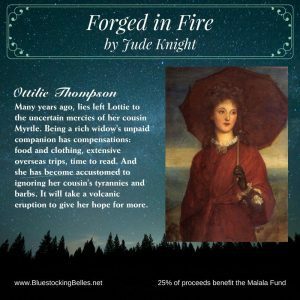 The first kiss in Forged in Fire comes nearly at the end of the novella. Sorry for the spoiler. But then you knew they had a happy ending, didn’t you? Happy reading! He tucked Lottie’s hand into his arm and began to stroll again. He let Lottie stop him again, but would not release the hand she tried to pull from his grasp. Tears stood in her eyes and she was shaking her head. He could barely stand at the blow, but she was asking a question and he made himself listen through the howling of his thoughts. “You love me?” Now it was hope that roared, bubbling up to fill him. Tad pulled Lottie into his arms. “Then a wooing it shall be, dear heart. For a short time.” She lifted her lips for a kiss, and he began his wooing. the 2017 box set of the Bluestocking Belles. This is a great compilation of stories that are going to be wonderful to read! Thanks Sherry and Jude! It’s our best yet, I think, Alison.